Set in the heart of vibrant capital KL city centre, Pullman KLCC offers guests the best of the city's attractions, entertainment and business hub. Public transport is also easily accessible, with buses and trains right at your doorstep. Pullman KLCC is near where globetrotters want to be: a short walk from Raja Chulan Monorail station and opposite the Pavilion Kuala Lumpur luxury mall. 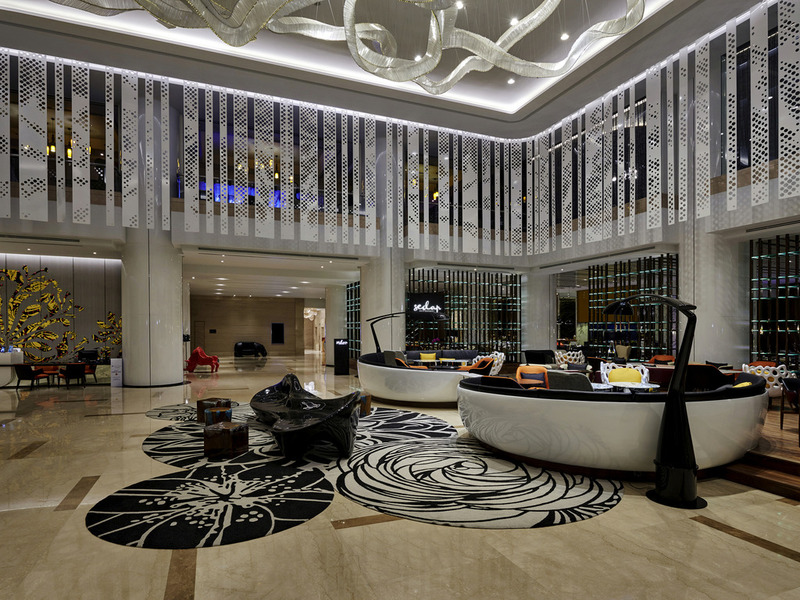 Pullman is in bustling Bukit Bintang, the city's shopping, dining and business centre. A sanctuary by the pool. Have a well-deserved relaxing time with a la carte menu while enjoying cool drinks. The bar serves a wide selection of beverages including Happy Hours for wines, beer, cocktails or juices. In general everything is OK. However the air condition is a bit warm even I turned to 19 already. Breakfast is not delicious. In the morning some days I had to wait for the queue with no concrete reason just because your waiter had to wait for another waiter to bring other guest to the table. Not well organized at all. Gerie at the reception are very helpful. On my 2nd day, i had switched off the DND sign for housekeeping to make up my room around 330pm. When i came back to the hotel around 630pm, i asked the HSKP staff if they can clean my room but got a reply &quot;we dont clean after 6pm&quot; I dont think Turndown service is part of the members benefit in this hotel. Very friendly and welcoming stuff from check in till check out. Everything was up to my expectation. Thank you for the enjoyable weekend. Our accommodation was pre-paid by the company, emailed the bank reference to Kit Ze-Kang by March 29 and we ( 2 guests for 2 rooms) checked in last Apr 1. Unfortunately, the front office did not acknowledge receipt of our payment despite showing the email reference for some reason maybe it was not yet cleared with the bank. Fine! but I would have appreciated if your front office staff atleast offered to get from us a minimum security deposit instead of the whole stay (5nights) deposit amount. It is not as if we dont have the capacity to pay knowing that our company already paid and there was an email reference shown! This matters to me bec the said amount was swiped using my PERSONAL DEBIT acct. (since i dont have my credit card with me that time) although I understand that the amount will be returned back to me as soon as the payment of our company was acknowledged . And as of this writing, the total amt. hasnt even been returned to my PERSONAL account yet! Add to the dismay, despite leaving a message about the prepaid payment upon check-in, there was not even an immediate follow up for the next 3 days with your bank or to whoever to validate what we are saying! The only time it was given the attention we were expecting was when we again for the 3rd time/day approached your front desk plus maybe the follow up made by my colleagues back in Manila to Kit Ze Kang in fear of checkout issues if you dont acknowledge our payment. This is a coordination issue! Something that is so disappointing and is not something I would have expected from such a premier hotel like yours. The front decks personal is very helpful friendly and professional during their duties. Me and my friend stayed here to celebrate my birthday and it was truly an amazing experience. Our room was lovely, the bathroom was beautiful and the rest of the hotel was stunning. The pool and bar area was so relaxing and we absolutely loved the buffet breakfast. The hotel also took extra care to make sure I enjoyed my birthday by bringing a cake and card to our room. We were so sad to leave and I’m sure I’ll be back again one day. Great Hotel and very accommodating staff! the hotel allowed us to checkin early and check out early. Extremely accommodating staff. The hotel is close to all the main Shops. It is quite a nice and convenience to stay in your hotel. Only thing that you may need to improve is housekeeping need to take notice the number of guests staying in the room. I have to call twice, once on the 2nd night and another on 3rd night to get my towel for my daughter even though I have given my number of pax in the room is 2 A and 1 C. Also there is no extra amenities for the 3rd person. It is important to have that noted by the start. Also the bathroom, the standing shower is leaking and lots of water flow over the shower area. It was ok and satisfying.. the only thing is that I think the building and the equipment there need a bit upgrade and updated cause compared to other pullman hotel, i thing this is the most outdated one (im talking about the rooms n its decor n applience provided inside the room). Front desk - overall is OK. I felt welcomed. Room Service - the housekeeping staff is man which I felt less competent, quality of work is less tidy and neat compared to lady keeper. I accidentally saw one the housekeeping staff buttoning his pants (maybe he just finished doing his business is guest's room toilet) while cleaning my bedroom. I felt unpleasant and I have to wait outside of my room while waiting them finish make-up the room. This should not the tolerated and housekeeping staff should have a ground rule during their present at guest's room. Concierge - Awesome F&B - Food at Sedap restaurant is delicious, staff are friendly. Training Room facilities - Pullman should consider having a proper area / room for training purposes. during my training session at Level 2 (Red restaurant) the setup is too gloomy and not enough lighting for learning environment. then, they moved us to Level 22 which they modify 1 bedroom apartment to accommodate the training session. However, having the food close by the classroom is GOOD as we can have a free flow food and coffee throughout the session.